Welcome to the Castle View House Bed and Breakfast. We hope you enjoy browsing our website and find a lot of useful information. 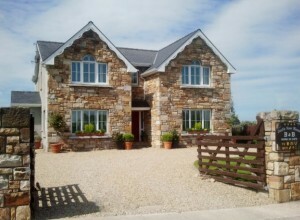 Castle View House Bed & Breakfast is a quiet and comfortable place to stay in Cliffoney, Co Sligo, Ireland. Castle View House Bed and Breakfast is conveniently located a short distance from both Sligo and Bundoran and provides you with the ideal location to access what both counties Sligo and Donegal has to offer. Mullaghmore is just a short drive or even walk away where you can appreciate the some of the amazing local scenery and amenities that are part of The Wild Atlantic Way. From Castle View House Bed and Breakfast, you can fully experience everything that Sligo and Donegal has to offer such as hill-walking, horse riding, surfing, wind surfing, golfing, fishing as well as the numerous sites of historical significance to the area. Sligo also has a rich literary history and was home to world famous poet, W.B. Yeats. Thank you for your warm welcome. Although it was a short stay, I would totally recommend this B&B. Very friendly and rooms are top notch and of show-house standard with really comfortable beds.